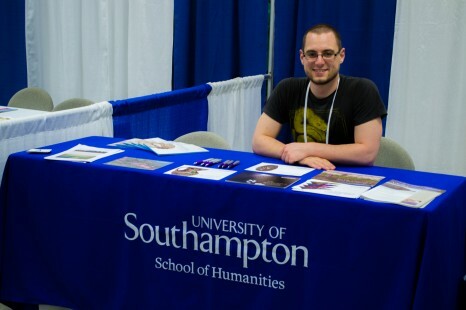 Recently, the department of archaeology at Southampton made its debut appearance at the Society for American Archaeology annual conference. This year it was due to be held in Honolulu, Hawai’i, which promised to make it one of the best-attended meetings of its kind. Besides the well-publicized size of the SAA meetings and the high esteem in which they are held, Honolulu is a desirable travel destination for very obvious reasons. Bearing this in mind, maintaining a stall in the exhibition that runs in parallel to the paper sessions struck me as an excellent opportunity for the department, and the university, to market itself as an interesting and innovative institution at which to pursue postgraduate study. To this end, myself and fellow PhD students Tom Brughmans (both Archaeology) and Iza Romanowska (ICSS), with the financial support of the department and the Faculty of Humanities, hired a booth and positioned ourselves to meet and introduce potential new students to the wide range of programs that Southampton offers during the five days of the conference. There is a tremendous interest among American students in opportunities of the kind that Southampton offers, in areas such as Human Origins, Maritime Archaeology, Social Archaeology and Rome/the Mediterranean. Although the wider academic community is aware of departmental expertise in these areas, reaching the people who actually attend these programs of study should also be a top priority. Furthermore, methodological specialties such as ceramic analysis, survey and osteoarchaeology also attracted significant attention, despite many similar programs existing within many American universities. This, to me, suggests that among potential recruits, there is a good case for choosing to study abroad at Southampton. In other words, the brand of the university has attractive potential in itself. Field schools, in this case the well-known and impactful Portus project, are too of interest and relevance to American students seeking to broaden their horizons. Finally, one of the initial and justified concerns of the parties funding the exhibit was that the target audience – undergraduate students – simply would not be able to attend an expensive conference in one of the more pricey and geographically-distant US states. This, surprisingly, was unfounded, as many people looking to move on to postgraduate degrees or to continue with further specializations at postgraduate level managed to find their way to our exhibit for a chat. A significant proportion of the 2012/13 cohort of MA and MSc students originate from North America, and several intend to pursue further postgraduate study. Anecdotal evidence from friends and colleagues at other UK/EU institutions who regularly appear at the SAA meetings suggested to me that sustained attendance at multiple meeting, over several years, has generated the greatest impact on student recruitment. Being able to contribute to the continuation of this trend, increasing the diversity of our student body, and raising the profile of the university was an immensely enriching experience. It is my hope we will be able to return to SAA 2014, in Austin, Texas, and for many more to come.